The MVP conversation is once again turning in Kevin Durant’s favour and he put in another impressive performance for the Thunder over the past week. Over a three-game schedule, Durant averaged 33.0 points, 6.7 assists, 3.3 rebound and 1.7 steals per game. He also had a magnificently efficient week scoring the ball, hitting 57.6% of his field goals, 40.9% from deep and 95.7% from the stripe. He might not be the consensus favourite for MVP anymore, but LeBron James did his best to remind the world he is the best player in the league this week. Averaging 25.0 points, 7.8 rebounds, 6.0 assist and 1.3 steals over four games – while shooting 55.4% from the floor – James capped off his week with a lackadaisical triple-double against the struggling Detroit Pistons. Houston Rockets guard James Harden is currently enjoying some stellar late-season form. The bearded one dropped a triple-double in only three quarters on the Philadelphia 76ers and scored at least 26 points in each of his three games this week. He finished the week averaging 29.7 points, 6.7 rebounds, 7.0 assists per game and shooting 50.0% from the floor. Joining Harden in the starting backcourt this week is Phoenix Suns point guard Goran Dragić. The leader of the upstart Suns put up 23.5 points, 3.3 rebounds, 5.3 assist and 1.5 steals per game as he did his best to solidify Phoenix’s position in the playoffs. He also continued to be a terrifically efficient shooter over his four-game week, nailing 59.4% of his field goals and 50.0% of his attempts from beyond the arc. Manning the pivot for the Team of the Week is first-year Charlotte Bobcat Al Jefferson. Big Al has been a revelation on the block for an improved Charlotte squad and he manhandled his way to averaging 25.0 points and 11.3 rebounds through three games this week. Jefferson managed two double-doubles for the week, falling only two rebounds short in his third game, and hit a methodical 55.0% of his shot attempts over the week. 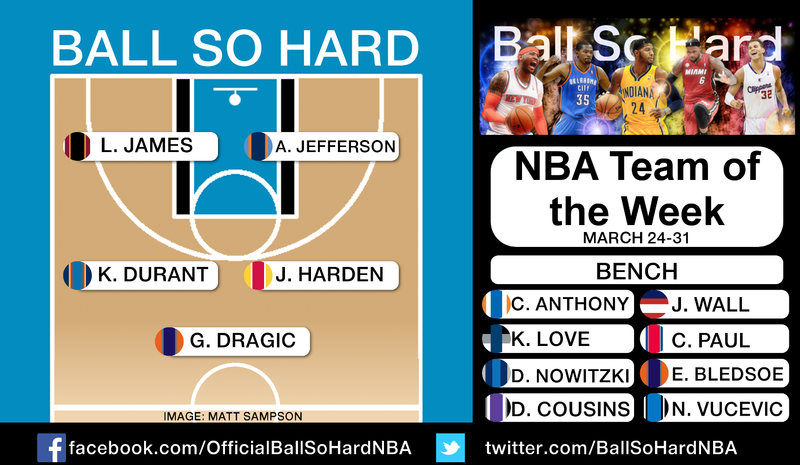 There is a strange relationship between each of the guards selected for the Team of the Week bench. Washington’s John Wall and Phoenix’s Eric Bledsoe were teammates in college at Kentucky, while Bledsoe was once Chris Paul’s understudy in Los Angeles. The other thing that binds them is their impressive play over the past seven days. Wall (22.3 points, 3.3 rebounds, 6.3 assists and 2.5 steals per game) steadied the ship for the Wizards, helping them to important victories over playoff rivals Indiana and Atlanta. Bledsoe (20.0 points, 6.0 rebounds, 5.5 assists and 1.8 steals per game with 56.3% shooting from downtown) was influential in the Suns continuing their unexpected push into the playoffs conversation. Phoenix went 4-0 over the week, extending their winning streak to six-straight and eight out of the last nine. Paul (19.3 points, 3,3 assists, 10.0 assists and 3.0 steals per game) carried the Clippers to a 3-1 record over the week, including impressive wins over Western Conference rivals Dallas and Houston. It has been a tough season for the New York Knicks and Minnesota Timberwolves, but one thing that can’t be questioned is the play of their star forwards Carmelo Anthony and Kevin Love. Anthony (29.5 points, 7.3 assists and 1.3 blocks per game – 46.3% field goals, 44.4% three-pointers and 93.8% free throws) put in four valiant efforts over the week despite his Knicks struggling to a 1-3 record. Similarly Love (22.0 points, 10.8 rebounds and 6.8 assists per game) played four magnificent games notching three double-doubles and one triple double (also falling one assist shy of a second) during an indifferent week for Minnesota, who finished the week 2-2. Meanwhile, Nowitzki (22.0 points, 8.5 rebounds, 4.5 assists and 1.0 steals per game) kept the Mavericks in reaching distance of the playoffs and was an instrumental cog in Dallas upsetting the Oklahoma City Thunder midweek. Rounding out the bench frontcourt is Kings big man DeMarcus Cousins and Magic double-double machine Nikola Vucevic. Cousins (21.3 points, 9.5 rebounds, 4.8 assists and 1.5 steals per game) had two double-doubles of at least 32 points and 12 rebounds and hit 59.6% of his field goals through four games. Vucevic (16.7 points and 14.7 rebounds per game) helped the struggling Magic to a 2-1 week and was a force to reckoned with against the Bobcats, scoring 24 points and grabbing 23 rebounds.